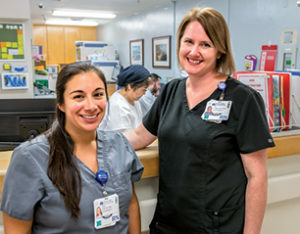 Nearly 200 of NorthBay Healthcare’s 2,600 employees are classified as veterans, and they can be found in every nook and corner of the organization, operating CT scanners and taking X-rays, caring for patients in Labor & Delivery, working in security and sanitizing patient rooms. As a sergeant in the U.S. Air Force and Air Force Reserve, Jaime Clemente served as an apprentice loadmaster and a journeyman jet engine mechanic. Today, he oversees 25 Environmental Services staff members who are responsible for ensuring the proper cleaning and disinfection of NorthBay Medical Center. This includes Emergency Department exam rooms, in- patient rooms, operating rooms and cath labs, and the nightly cleaning of most offices in the medical center, as well as the proper disposal of soiled linens; trash; medical, biohazard and hazardous waste; and the use of Tru-D, the ultra violet (UV-C) radiation disinfection system. Is the work he did in the Air Force different from what he is doing now? “Not really. Paying attention to detail and working in areas most people would not want to work were hallmarks of my life then, and that continues now,” he says with a chuckle. His first environmental services manager, also an Air Force veteran, hired him because “as a fellow veteran, he said he knew I was well-trained in the ‘art of cleaning things,’” he added. Jerry Simmers broke the chain when he joined the U.S. Air Force. “My father, grandfathers, brother and brothers-in-law were all coal miners in western Pennsylvania. I didn’t want to work in the coal mines!” So, as soon as he turned 18, he looked to the heights, and achieved them career-wise during his 26-and-a- half-years with the Air Force. 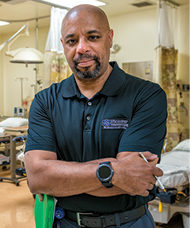 He worked his way up through the ranks from chief master sergeant to laboratory technologist, laboratory manager, and to squadron superintendent before becoming laboratory career field manager for the entire Air Force, working for the Air Force Surgeon General. Lisa Torgerson, right, is with fellow Air Force veteran and coworker Olivia Avila, R.N., at NorthBay Medical Center. And then 9/11 happened. “My husband was deployed several times, often six months at a time, and that’s when I began my most important service —as a military spouse.” They moved seven times during 20 years and she held down the fort as the family grew to include three children. “I have a lot of respect for military spouses, because I know they serve, too. They are willing to make sacrifices, not only for their country but for their family,” she said. The Torgerson family settled in Vacaville, and her husband, Jason, retired after 20 years to continue flying with a commercial airline. She returned to nursing, this time with NorthBay Healthcare, in 2014. 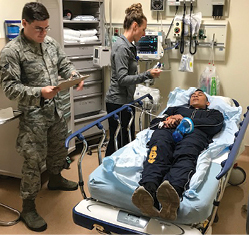 This photo was taken by Sean Zortman during a recent drill with NorthBay Healthcare and Travis Air Force Base personnel. The 9/11 attacks played a key role in Sean Zortman’s enlistment to the U.S. Air Force, where he was trained as a firefighter and driver/operator. He served for just over four years, all during Operation Enduring Freedom. is essential in creating a safe and healthful place of work,” said NorthBay’s Environmental Health and Safety manager.